Thank you for visiting the "Article V - Constitutional Convention" page where you will learn if you have the constitutional fortitude for an Article V Convention. FULL DISCLOSURE: After doing my own homework, it is my learned opinion that given the state of our unconstitutional federal and State governments I AM VEHEMENTLY AGAINST AN ARTICLE V CONVENTION OF ANY TYPE! But I remain open to an intelligent, adult conversation for an Article V Convention...I just haven't heard one that convinces me. My firm belief is this: The 58 men who debated, wisely crafted, and signed the Constitution of the United States (January 10, 1791) are altogether more intelligent and wiser than the 535 idiots now in Congress. Every elected servant and appointee swears a solemn Oath of Office to "preserve, protect, and defend the Constitution of the United States against all enemies, foreign and domestic..." The REAL problem in Washington, DC is that our elected servants are NOT honoring their Oath of Office because they either don't know and understand the Constitution and the Republic that our Founding Fathers intended, or they just plain don't care. The first case is simple ignorance. The latter case is at least Perjury and possibly Treason. The old adage is true, "Power corrupts and absolute power corrupts absolutely." What were once Statesmen have fundamentally transformed into politicians, and worse, our elected "servants" have become self-serving political whores. It's high time that we clean House...and the Senate. ". . . constitutional prohibition against [U.S.] Senators and Representatives serving as delegates to an Article V Convention. 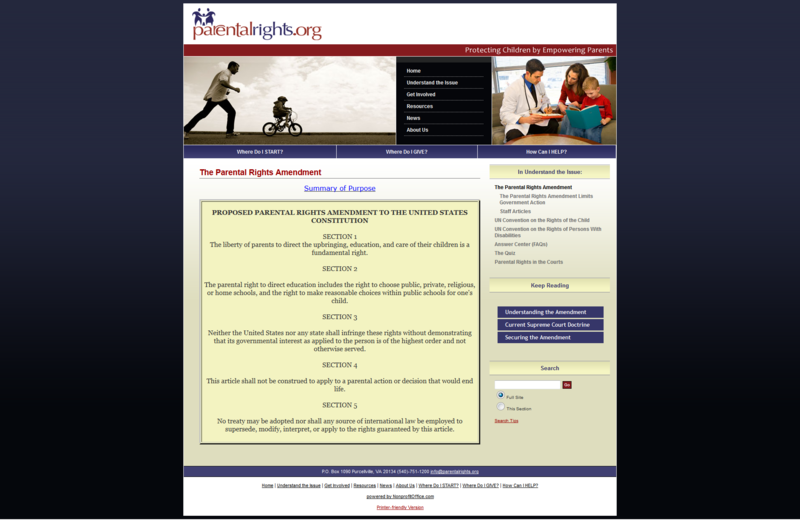 . . "
The text of the "parental rights" amendment is HERE. For a discussion showing how Michael Farris' proposed amendment delegates power over children to the federal and State governments, go HERE and HERE. To see how six of Mark Levin's so-called "liberty amendments" do the opposite of what he claims, go HERE. To see – on one page – proof of the original intents of the "interstate commerce," "general welfare," and "necessary and proper" clauses, go HERE. The proponents of a convention portray the States as victims of federal tyranny. But the Truth is that the States voluntarily surrendered their retained powers, and the natural rights of The People, TO the federal government. And they did it for federal funds. Today, States get from 20% (Alaska) to 45.3% (Mississippi) of their State budgets from the federal government. State governments don't want to rein in the feds! The people who run your State will do anything to keep their federal funds. HERE is the Pew Report. HERE is James Madison's letter of Nov. 2, 1788 to Turberville. Copy it to word processing, make paragraph breaks, & highlight it. Madison NEVER supported the convention method of amending our Constitution. HERE is Joe Wolverton's article about the Socialists' involvement in the push for a convention. HERE is the Constitution for the Newstates of America. Article XII addresses ratification by a referendum called by the President. Read HERE about the proposed Constitution for the New Socialist Republic in North America. Read them and see what is being planned for you. HERE is the screen shot of Jordan Sillars' comment approving the re-writing of our Constitution. For Q's & A's on this issue, go HERE. There is no such thing as a "convention of states" to propose amendments. The term is a marketing gimmick used by proponents of an Article V convention to manipulate people into believing that the States would control an Article V convention – from start to finish. Congress calls a convention for the purpose of proposing amendments [for good reason, we have never used this method]. Even though we have never had an Article V convention; Congress has examined procedures for "calling" a convention so as to be ready if the need arises. The CRS Report proves that Congress has historically viewed its powers respecting "calling" a convention as exclusive and extensive. I thank Robert Brown for bringing the CRS Report to my attention. The position Congress has historically taken in this regard is totally consistent with Article I, Sec. 8, last clause, which delegates to Congress power to make all laws "necessary and proper" to carry out the power vested in Congress at Art. V to "call" the convention. "... there is no effective way to limit or muzzle the actions of a Constitutional Convention. The Convention could make its own rules and set its own agenda. Congress might try to limit the Convention to one amendment or to one issue, but there is no way to assure that the Convention would obey. After a Convention is convened, it will be too late to stop the Convention if we don't like its agenda. The meeting in 1787 ignored the limit placed by the Confederation Congress "for the sole and express purpose. . ."
The following series of videos are from the "Conference on the Constitutional Convention" hosted by the Harvard Law School on September 24, 2011. I tried to locate them all and put them in order in order to present the complete conference. The order of the videos are not nearly as important as their content. The following videos are a conference and discussion of the pros and cons of a Constitutional Convention. Following this series of videos are additional videos grouped in "Pro" and "Con" fashion, which, in my opinion, are more lively, interesting, and colorful. This video was uploaded by Harvard Law School on Oct 5, 2011. HLS Professor Lawrence Lessig and Mark Meckler, co-founder and a national coordinator for Tea Party Patriots, delivered their opening remarks for the Conference on the Constitutional Convention at HLS on September 24, 2011. This video was uploaded by Harvard Law School on Oct 6, 2011. HLS Professor Lawrence Lessig, founder of Change Congress, delivered his "Keynote from the Left" at the Conference on the Constitutional Convention on Sept. 24, 2011. This video was uploaded by Harvard Law School on Oct 6, 2011. Glenn Reynolds, professor at the University of Tennessee School of Law and founder of Instapundit blog, delivered the "Keynote from the Right" at the Conference on the Constitutional Convention at HLS on Sept. 24, 2011. This video was uploaded by Harvard Law School on Oct 6, 2011. In a discussion moderated by Conference Co-chair and HLS Professor Lawrence Lessig, panelists John Baker, Nick Dranias, Sanford Levinson, Barbara Perry, and HLS Professor and constitutional scholar Laurence Tribe considered the structures that would define an Article V Convention. This video was uploaded by Harvard Law School on Oct 14, 2011. The Political Panel discussed some of the issues that would be likely to arise at an Article V Convention, and whether or not a convention would represent an opportunity to forward the causes they hold dear. The panel featured Andy Biggs, David Cobb, Alexandra Filindra, Rob Richie, John Samples, Brenda Wright, and was moderated by Cenk Uygur. The following video was uploaded by Harvard Law School on Oct 14, 2011. In a discussion moderated by David Segal, panelists discussed whether and under what circumstances the groups and constituencies with which they are affiliated would support calling for an Article V Convention, and what it would take to proceed with a push for a convention. George Friday, Shane Larson, Bill Norton, Curtis Olafson, Annabel Park, Jefferson Smith, Bill Walker participated in the discussion.